Few brands can boast 100 percent client satisfaction, and airlines are certainly not among those rare few. When complaints gravitate around the usual weak spots – disappointing customer service and lack of regard for passengers – the line between imperfection and bad reputation narrows. Today, disgruntled travelers are stepping up their game; not only do they strike back on social networks such as Facebook and Twitter but they are also using a new weapon: creativity. An engaging “social” complaint about a real airline deficiency can hit hard. When musician Dave Carroll posted a YouTube music video titled “United (Airlines) Breaks Guitars” (his guitar was mishandled during a flight and customer service responded poorly to his claim), it instantly became an anthem for every traveler who ever had a luggage complaint go unheard: today, the video has almost 15 million views. Unsurprisingly, as Carroll explains, United “Were unprepared to handle a social media wildfire. (They) have been criticized by customer service and social media experts around the world for both what they did and did not do properly. While the conversations were taking place online, United typically responded with traditional media releases.” Airline travel and customer complaints go hand in hand, especially since the boom of low-cost flying. In 2014, a lengthy rant aimed at Ryanair appeared on James Lockley’s Facebook page; the post, infused with humor and satire, has been shared thousands of times on Facebook and Twitter and landed on the pages of major newspapers worldwide. Needless to say, it didn’t do wonders for Ryanair’s reputation, as the company has already been under fire for its “no apologies” approach to budget flying. Next time you’re at an airport and something goes wrong, don’t rush to the other corner of the terminal to join the hell-on-earth customer service line. And before you go home upset and decide to record a YouTube video damning the company for all its faults, keep in mind that an alternative lies right in your pocket. 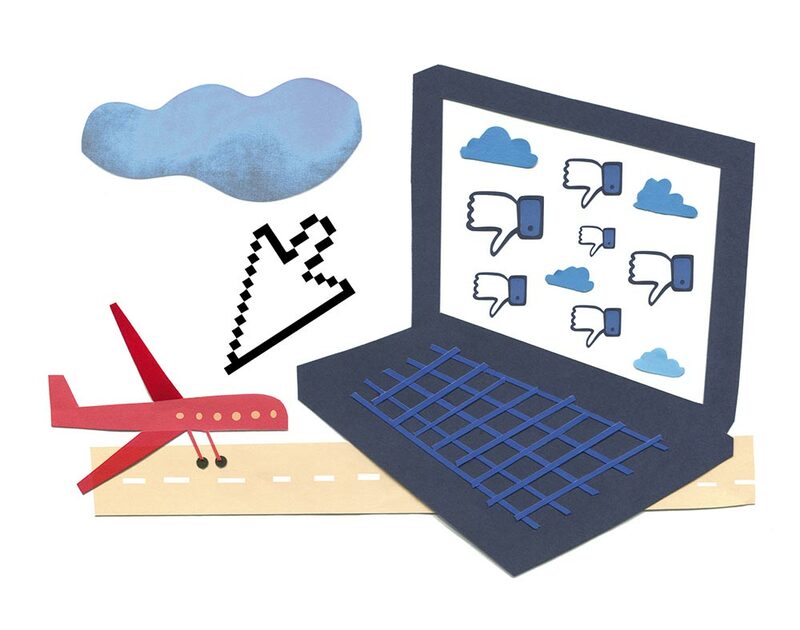 As more than 200 airlines now use social networks, the solution to your dilemma might just be one little tweet away.